Indium Corporation will feature materials for LED manufacturing at Strategies in Light, February 12-14, 2013, in Santa Clara, California. Indium Corporation provides materials for every level of LED manufacturing: from die-attach to sub-mount, sub-mount to assembly, and thermal interface materials. Indium Corporation offers a full line of gold-tin (AuSn) solders. AuSn alloy provides great joint strength, offers superior resistance to corrosion, and superior thermal conductivity when compared to standard solders. Die-attach thermal requirements often mandate a high-melting die-attach solder. With a melting point of 280° C, eutectic AuSn satisfies these demands. Indium Corporation offers a variety of solders that will fulfill sub-mount to assembly needs. Indium offers lead-free and lead-containing solder pastes, bar solder, wave solder, and flux-cored wire. Indium Corporation provides Solder Fortification® preforms, which are designed to solve defects caused by low solder volume. Solder Fortification® preforms offer increased solder volume, improved drop-test results, fewer issues with flux residue, reduced rework, and improved fillet shape and volume. 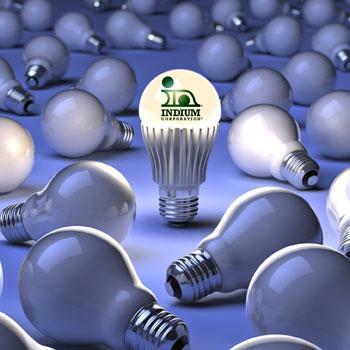 Indium Corporation is a provider of Thermal Interface Materials (TIMs) for LED assembly. We offer a wide selection of metal-based TIMs for reflow or compression. Our patented Heat-Spring® is a compressible interface material with 86W/mK conductivity. NanoFoil® is a predictable, controllable, and affordable material that is industry-accepted and proven to lower manufacturing costs, while providing repeatable and reliable bonds and reactions. NanoFoil®-based materials can deliver energy in a controlled and precise manner for joining, energetics, and heating applications. Additionally, Indium Corporation provides indium trichloride and gallium trichloride for manufacturing common MOCVD precursor materials for LEDs. Indium specializes in supplying indium and gallium compounds at high purity and high volume. For more information about Indium Corporation products for LED manufacturing, visit our website at www.indium.com or email LED@indium.com.